Panic attacks can be associated with a variety of psychiatric diagnoses, including generalized anxiety disorder, social anxiety disorder, phobias, depression, posttraumatic stress disorder, and substance use disorders. 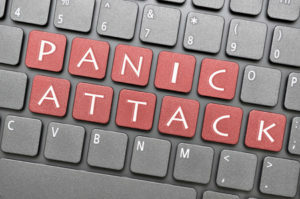 Panic disorder is a menta l health condition which involves recurrent unexpected panic attacks as well as either persistent worry about having additional panic attacks, or avoidance behavior (avoiding exercising, enclosed spaces, unfamiliar situations, etc.). So, while individuals with panic disorder certainly experience panic attacks, not everyone who has a panic attack has panic disorder. As you can see from this chart, the same physiological processes that are helpful for survival when faced with a threat are also responsible for panic attacks. A panic attack is best thought of a helpful reaction occurring in response to the wrong triggers. These triggers can be stressful or shocking thoughts or emotions (as in the case of predictable panic attacks), or even small physiological changes outside conscious awareness that activate the fight-or-flight response. Thankfully, there are effective treatments for panic symptoms and the suffering they can cause. Cognitive-behavioral therapy (CBT) has been proven highly effective in the treatment of panic attacks and panic disorder. CBT for panic entails learning and practicing various skills that impart long-lasting benefit and symptom relief. Medications, such as benzodiazepines, can also be effective are often prescribed to help manage panic attacks. However, unlike psychological treatment, the benefits of these medications are lost when the medication is discontinued. Consider consulting with a CBT therapist if panic attacks are interfering with your wellbeing and overall functioning. Panic attacks do not have to be a part of your life.